Gregory the Great was pope from 590 to 604, a period in which he had to deal with an unsympathetic emperor in Constantinople and invading barbarians who were setting up a kingdom in northern Italy. In the middle of it all, he transformed the church administration, improved monastic practices, wrote some of the most important scriptural commentaries of the middle ages--and sent a mission to convert the English. 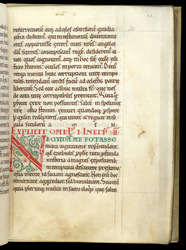 This copy of his homilies on the Book of Ezekiel belonged to the cloister of St Andrew's Cathedral, Rochester. The cathedral had historical links to Gregory. It was founded in 604 by Augustine, the missionary sent by Gregory from his own monastery of St Andrew in Rome. The book arranges the homilies so that they are preceded by the appropriate text from Ezekiel. This page has the beginning of the second homily on Ezekiel, Chapter 40. After the first several pages of the manuscript, the first letters of the homilies become simpler, decorated with conventional red and green painted designs instead of the clever drawings of animals and human figures on the first two decorated initials in the manuscript. A book like this would have been used for study and possibly also have been read from during mealtime, daily prayers or chapter meetings.